Christmas Eve … we packed into the farm home of my mother’s childhood, along with the families of her sister and her two brothers. We drove over from Holland’s north side, closest to Grandma & Grandpa Abel’s home in Georgetown Township; the rest of mom’s family had moved to the Pontiac area in the 1940s. Grandma had wonderful carousel-like ornaments that hung over some of the large electric tree lights. The heat from the bulb would cause the inside of the ornament to whirl around or in others, to cause bubbles to move inside. Silvery ice cycles hung on the branches. Sadly, the family of my Uncle John would always have to leave early (or maybe they actually arrived late?) to join with my Aunt Myrtle’s family who lived just down the road in Hudsonville. One year, I was able to ride back to their home in Pontiac and stay with them for the week. Aunt Myrtle would make great hot chocolate for us to enjoy when we came back in from playing in the snow! My parents would collect me when they came over to enjoy another large family meal on New Year’s Day with all of my Abel & Swindell cousins. I remember one Christmas Eve when an injured person knocked on the back door of my grandparents home. He had been involved in a serious automobile collision on the corner of Grandpa’s farm. Our dads went over to the scene of the accident to help as they could, until the police arrived. 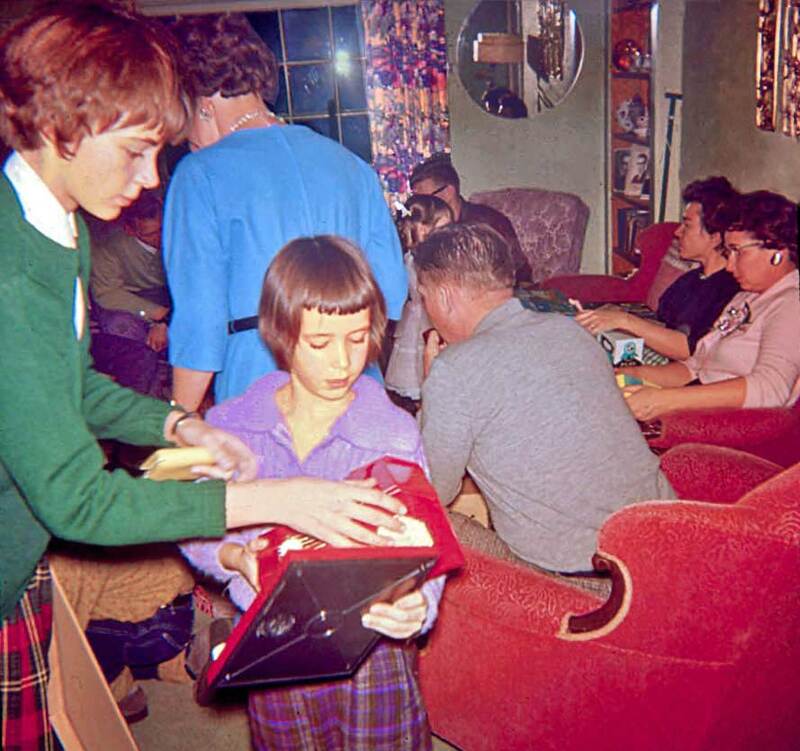 I was only nine years old when the last of those great Christmas Eve gatherings occurred in 1964; my grandparents both died before the next Christmas. It is amazing to me that all of the memories that I keep about my Abel grandparents, were made in my first ten years. I don’t recall if we continued to gather with my mother’s family after that year…perhaps my cousins will shed some light on this?